December 27, 2018 December 28, 2018 rusticcornerblog2 Comments on A little update on all things Bohlman Family Christmas! A little update on all things Bohlman Family Christmas! Hello Everyone! I hope that all of your Christmas celebrations went well. We have been running non-stop since our plane touched down on Saturday but we are so grateful to be home. I wanted to share a few more things with you all about our trip to Boston! Get ready because there will be a ton of pictures! Before we made it to the airport on Saturday, we made a stop at the Boston Children’s museum. What a place! there were so many rooms with such a vase array of activities for kids! Everything from jungle gyms, bubbles, balls, construction and Arthur from PBS. We made it to the airport in plenty of time to find a place to relax for a while. That children’s museum tired us all out! Ollie was able to check out the cockpit as well as get his first pair of wings from the pilots! The flight home went great and we made it to our car with no issues. Getting home on the other hand. Well that works better if the battery on the car is charged! So a slight delay there but otherwise a wonderful trip. On Sunday, we celebrated my birthday. It was a day spent in pajamas, watching movies and enjoying time spent as a family again. My dearest friend, Beth was able to stop in with cake as well. Oh, and she cleaned my house while we were away… she is a keeper. We couldn’t be more grateful! there is nothing more wonderful than coming home to a clean place. Ethan and I both come from families with six kids so family get together s are extensive. Every Christmas Eve is spent with Ethan’s side of the family. We play games, decorate cookies and eventually open gifts. Oh and we eat. There is never a shortage of food at Mom and Dad Bohlman’s! Our traditional Christmas meal is Snow on the Mountain. It is one of my favorites and something I look forward to every year. For those of you who don’t know what it is, I will do my best to describe it for you. Start with a base of rice, either white or brown, whatever your preference. Then add the chicken with gravy. Then it is really up to you. 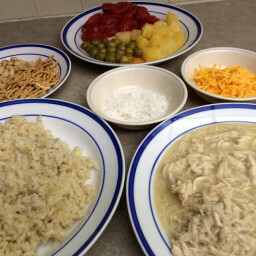 Toppings range from, cheese, peas, noodles, almonds, water chestnuts, and at the very top, coconut as the snow. It is truly quite delicious! We all had matching jammies this year. Ollie has started to look forward to this tradition. He tends to wear his all year long! We spoiled the boys with a train set this year. It has been so much fun teaching them to make new tracks and send their trains on all sorts of adventures. Ollie usually builds as Declan follows and destroys. Oh well right! Christmas day was spent with my side of the family. We gather and Dad reads that Christmas story before we all exchange gifts. The kids open and retreat for movies and popcorn. Leaving the adults behind for a quieter opening time. It was a wonderful time spent with family! We were also able to gather this morning for our annual Christmas break Bowling party! Overall it was a wonderful Christmas this year! So many activities but so many memories made. As for Ollie, he goes to see his specialist at Helen Devos on January 15th. From there we will discuss possible out patient surgery that can be done here in Grand Rapids in the next few months. The ultimate goal for us is to get insurance to cover future trips to Boston, so that we are able to head out there sometime this next year for debulking surgery. So please keep us in your prayers about that. If anyone has specific questions about our trip or procedures that I have mentioned, please feel free to ask! for the coming year. Keep posting please ! Glad your family all seems to be doing so well. God bless.